Being a remote team leader is everything but easy. It's heck of a ride, packed with leadership challenges, demanding a lot of trust and patience. Nonetheless, it's a rewarding experience. Looking at the facts, it's clear, we're going to see more and more remote team leaders in the near future. Compared to 2005, the proportion of remote workers has already grown by 80%. According to 2009 Forrester report, 34 million people work from home in the U.S and this number is expected to increase by another 29 million people. Compared to 2005, the proportion of #remote #workers has already grown by 80%. When you're deciding whether or not to let your people choose where and how they work, consider this. Companies that allow employees to work remotely, are more likely to report revenue growth of 10%. What is more, being able to choose the preferred location for work makes employees more satisfied and more productive. It makes them view the company as more innovative than the competitors. According to HBR article by Sylvia Ann Hewlett, 83% of Millennials and 75% of Boomers say that the freedom to choose when and where they work motivates them to give 110%. But before you'll be able to enjoy the benefits of a remote team leader, you need to solve some pressing issues. Namely, in remote teams the all too human face-time becomes luxury. How to handle the loss of one primary way you've always handled teamwork? How to handle the loss of face-to-face interactions? Ditching the physical environment for daily teamwork means you need to start embracing new ways to collaborate. Here's how already successful remote teams have managed to adopt to their situation. "When you’re not seeing people every day, the only thing you’re in constant communication around is the work itself, so that baseline has to be there"
Hire people according to the work they do, not to the beautiful stories they can tell in their resumes. Make it more than just a one-off. Remote working must become part of the culture, not just an individual person working from home. Instead of underwork, keep an eye on overwork. People working from their chosen location tend to struggle more finding work-life balance. So, even if your team-members love their jobs, the remote team leader needs to watch out that they also have enough personal time. Make regular one-on-ones. Managers need to schedule regular check-ins to maintain an open line of communication. Establishing a culture of trust and respect. When working miles, continents apart, trust becomes even more important. So, do arrange period meetups to establish strong relationships. Starting from day 1, Zapier has been a remote team. The way they have made it work is through powerful processes. Being a web-app automation service, they demand everyone on the remote team to do customer support. The responsibilities are divided in a way that 3 weeks are meant for regular job tasks and 1 week for support. Every single Friday the team at Zapier gets together in Google Hangouts to sum up weekly events. After that, a 10 minute break is taken to let one person in the company prepare a short presentation on any topic of their choice. Zapier's culture embraces feedback. They have monthly individual one-on-ones, but also daily feedback rounds. Although most of these interactions take place via technology, they value in-person interactions. They strive to bring the team together at least 2-3 times a year. 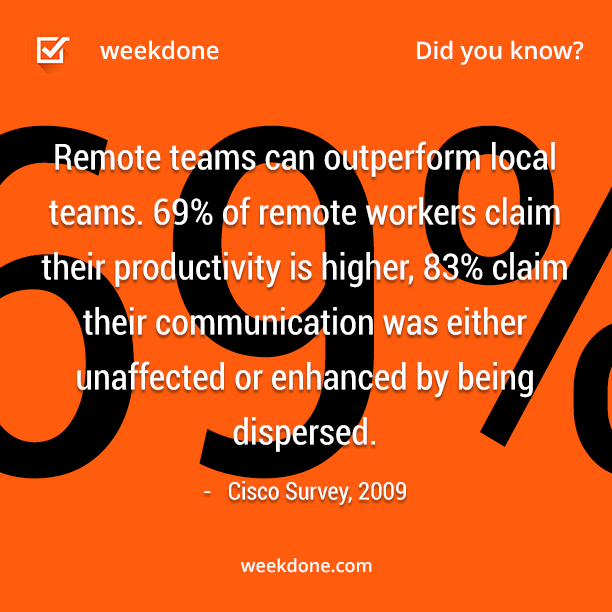 This is another great thing about remote teams. You can travel and meet such a variety of cultures. Leading a fully distributed team was a decision Joel Gascoigne, co-founder and CEO at Buffer, made already in 2012. Although choosing the right kind of people is a crucial part, 45-day contract period helps come to an understanding whether people are self-motivated and a right fit to the team. After all, they don't have working hours. They don't even measure hours at all. To keep the teamwork flowing, they call HipChat, a team chat tool, their office and Sqwiggle, the video chat tool, their conference room. The more miles are separating these distributed employees, the more information they seem to share. For some, it might seem like intrusion of privacy, for others, it’s just a way to stay connected and boost team motivation. In their conquest to increase facetime, they hang out in Hipchat. It’s a where the everyday communications, new favorite band suggestions are shared, great client feedback is posted and special occasions are celebrated. They even go as far as openly admitting how much each team-member is making and how much sleep they’re getting. Last, but certainly not least, is the social media tech start-up AgoraPulse. With 11 people on board and growing, they're working remotely from Paris, Poitier, San Francisco, and Mexico City. Even though they are working remotely, operating efficiently in over 120 countries, they're not scattered. To know who's working on what and how much they've accomplished, they use Weekdone's weekly progress reports. Each Monday, team-members use Weekdone to create a weekly task list, which is visible to everyone. As the week moves further, tasks go from "Plans" to "Progress" so that everyone can see what's been accomplished and what is still left to be done. What is more, the system makes it easier to connect as co-workers and maintain the cohesion. Are you leading a remote team? How have you managed to keep your team together? Remember to follow us on Twitter, Google+ and Facebook for all about reamote teams, working remotely and more! We're also on LinkedIn and Slideshare, posting about Team Leadership & Management, Telecommuting & Working From Home. Subscribe to our Leadership Academy newsletter on building great companies for more tips about Team Leadership & Management, Telecommuting & Working From Home. 23,300 awesome subscribers.